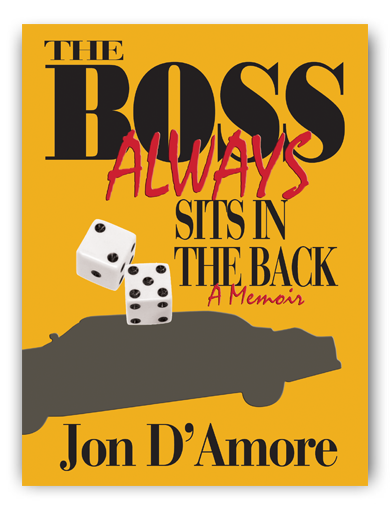 The Boss Always Sits In The Back is a story of love, honor, respect and a young man’s loss of innocence. Jon D’Amore, the storyteller, watches as respect turns into duty...and that duty is an order to serve Mob Justice and kill The Boss. From the side-lines...Jon is there. The underlying story reveals Jon’s relationship with his cousin and Godfather, Jerry D’Amore, from 1975 to Jerry's death in 1999. But before Jerry died, Jon had him tape-record the details of what happened behind-the-scenes...the things Jon never saw...but knew happened. Jon was born and raised in New Jersey, right outside of New York City. His closest relatives, such as his father Carmine and cousin Jerry...were connected with the Lucky Luciano and Vito Genovese Mafia Families. But Jon had no desire to be a part of the family business and followed his dream of becoming a musician. In 1975, for Jon’s 22nd birthday, he is invited to Las Vegas by his Godfather...where Jon unsuspectingly...then willingly... becomes part of a scam that funnels millions of dollars out of several casinos over the following two years. He becomes part of Vegas history once the scam is exposed...as it forever changes gambling laws in Nevada...and everywhere else in America. One thing leads to another and through family affiliations Jon is summoned by the New Jersey Mob Boss, Rocco Casiano. Through Jon’s knowledge of recording studios he proves that the New Jersey State Police edited audio tapes, which saves The Boss from 40 years in prison. Jon is suddenly looked upon by the Mob Community as the honorary Godson of The Boss, and christened “The Kid”...while not wanting to be involved at all. He just wanted to continue his music career. Throughout the story, The Boss’s fears turn into paranoia...and paranoia turns into cold-blooded murder. This is an exciting, humorous, suspenseful and entertaining account of one of the greatest scams to hit Las Vegas...one that’s NEVER been exposed in print or film before! It’s also a story about the demise of the mobsters that ran New Jersey...and best of all...it’s all true!